Back in September, we launched a mission to find the next big artistic talent in the UK - inviting artists, creators and designers to upload a photo of their unique work to Instagram using #LibertyOpenCall for the chance to have it immortalised in iconic Liberty Fabric. From digital drawing to illustration, over 5000 incredible entries rolled in. Tell us about yourself and your artwork style… I am a lifestyle store manager moonlighting as a print designer in the little town of Arundel in West Sussex on the South Coast. I trained as an illustrator at The Cambridge School of Art in 2010 and went on to design mainly for textiles; making homewares such as lampshades, cushions and wallpaper featuring my designs. I work with the medium Scraperboard. Scraperboard - sometimes called scratchboard - gives the effect of relief printing processes such as etching and linocutting, and was used widely in the mid-20th century as an easy way to produce illustrations for print in newspapers and magazines. Original scraperboard artwork is black and white. As I've developed my work with this medium, I've learned to colour the scraperboard digitally. I love the medium because it feels very traditional and timeless, yet the digital colouring process introduces a modern, vibrant element allowing the designs to be more commercial. Tell us about the artwork you submitted… My Liberty Open Call entry is titled Palace Gardens. I made the image using scraperboard and coloured it digitally by scanning the original artwork and using a tablet with Photoshop. 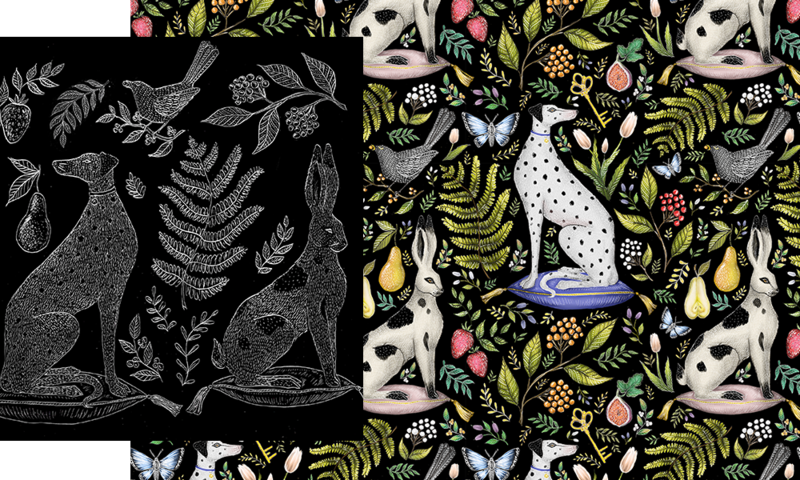 The image features everything visually irresistible to me; leafy plants, fruit, birds, insects and a couple of my favourite furry friends in the style of old Staffordshire pottery figurines, which I adore! It's called Palace Gardens because of its luxurious and regal feel - complete with an antique golden key which I imagine unlocks the Palace Garden's grand gates. My initial idea was to design something with an exotic theme, based on Liberty's beginnings and its founder bringing luxurious goods home to London from distant lands. However, it felt a lot more instinctual to indulge in the brand's British heritage as well as my own background - sketching richly-coloured fruits and foliage celebrating our expertise in and love of gardening. I imagine the view from a high window of a luxurious English Palace, the sill lined with these precious figurines looking out to a vibrant and full garden containing of all these sumptuous elements on a hazy summer's day. The Liberty brand ethos echoes an important message in my work - timeless style. It is very difficult in this fast-paced and trend driven time to produce such a thing whilst remaining commercial. Huge influences of mine, including William Morris, Walter Crane and Josef Frank, created designs which have stood the test of time - something I can only hope mine will do. Tell us about yourself and your artwork style… I live in Surrey with my two daughters and my husband. As a mother, my daughters are my greatest influence but also my hardest critics. I am half English and half Norwegian and have lived a year in Oslo and a year in Lillehammer. My ‘art’ education is based upon eight years of intensive searching for art and culture during my days travelling worldwide as cabin crew with British Airways. My painting journey began after leaving British Airways to have children. Since 2011, I have been employed as an art instructor/manager at Arthouse Unlimited, a charity working with artists living with complex epilepsy and learning difficulties. My paintings today are spontaneous and intuitive, expressive and emotionally charged. Each picture begins with a single brush stroke, starting a conversation. My artwork aims to create paintings to dream into, where we can be happy. Constructing an intuitive world to get lost in, somewhere beyond our vision, past the horizon, between the sky and the sea. A place to return and revisit, to explore and rediscover and, while immersed, lose and find yourself for a moment in time. 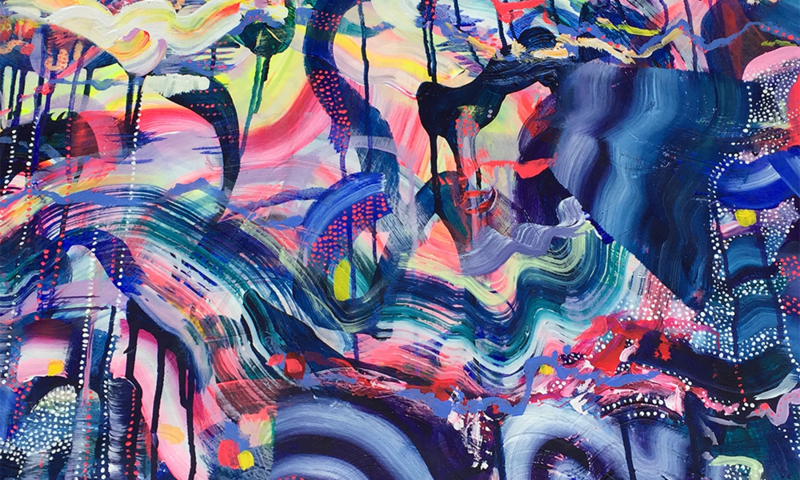 Tell us about the artwork you submitted … The painting I have submitted is called Graffiti Summer, it has been made with acrylic paint on rolled canvas. This picture has taken me on a journey, more so than many others. The multiple layers painted over and over, and some scrubbed away, have given me great pleasure and delight - but also pain and awkwardness. I feel that these highs and lows and uncertainties have created a certain depth within the painting. It has its own story within and I like that it has a raw expressive energy, while at the same time there are areas of delicate beauty, in colour and tiny detailing. I’m like a sponge inspired by everything around me; it could be anything that catches my eye within colour and pattern, culture or otherwise - hiding in the simplicity and mundane of the every day. Mostly I’m inspired by nature, its repeat in pattern, the colours and changes of seasons - but predominantly I’m intrigued and fascinated by the sea and the sky. To be associated and seen at Liberty would be a privilege, it would give me a huge boost and reassurance, while giving me the opportunity to share my work on a larger platform. The design process itself also excites me and I look forward to taking my art work to another level, pushing the boundaries and possibilities of my artwork even further. Tell us about yourself and your artwork style… I am a painter, drawer and printer from Gravesend, Kent. My colourful designs incorporate elements from my childhood, imagination and everyday life. I am keen to make art accessible to more people. I regularly exhibit my work in the UK and sell throughout the world. I also get involved in collaborative and fundraising projects, such as Art on a Postcard. 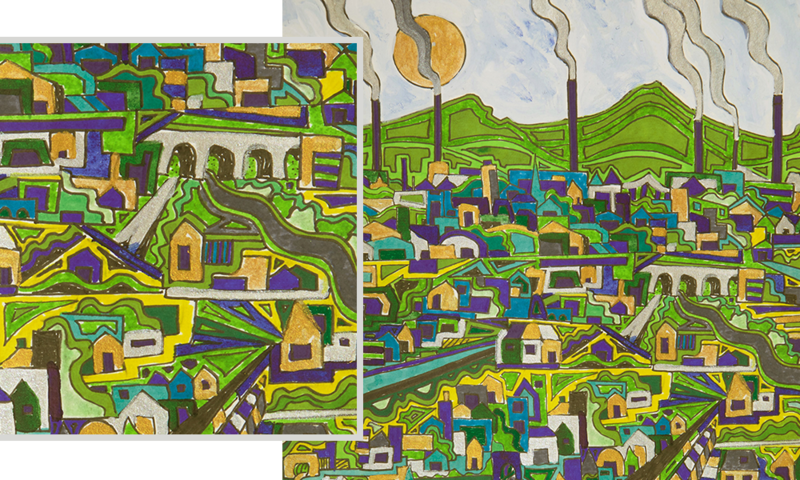 Tell us about the artwork you submitted… The artwork is called Green Town - ink on 300g acid free paper. One of an ongoing series of "smalltown" ink designs, born out of a doodling style I seem to have developed. Elements of childlike depictions of a colourful, slightly abstract, simplified world. Chimneys were ever present in my childhood, visible from everywhere around my hometown of Gravesend. I remember looking around Liberty as a young teenager when my brother worked next to the London Palladium. When I went to see him, I would look at the wonderful sights in Liberty. William Morris designs probably got me interested in art, so it would be pretty cool to follow just a tiny bit in his footsteps. Tell us about yourself and your artwork style… I am a self-employed British designer working from my studio in Hove, Sussex. Over the past 15 years I have been providing Visual Identity and Branding solutions for small businesses. I was born in Hong Kong and have lived in Texas and Bangkok and think that these bold and vibrant places have certainly had an influence over my style. I am fascinated with the folklore of plants, fashion history and swoon over any faded grandeur. I love English Heritage and any authentically produced period drama - I often have one playing as I work into the night. In May, I launched my own brand 'Studio Coverdale' to satisfy my desire to create utterly fantastical, bold floral illustrations without restraint. I would describe my style as joyous but seductive, luxury with a pinch of playful. A colourful escape from reality. Tell us about the artwork you submitted… Pearl Fern, Electric Poppies and Dragon Bells blossom and bloom under the many moons and dark helium sky. 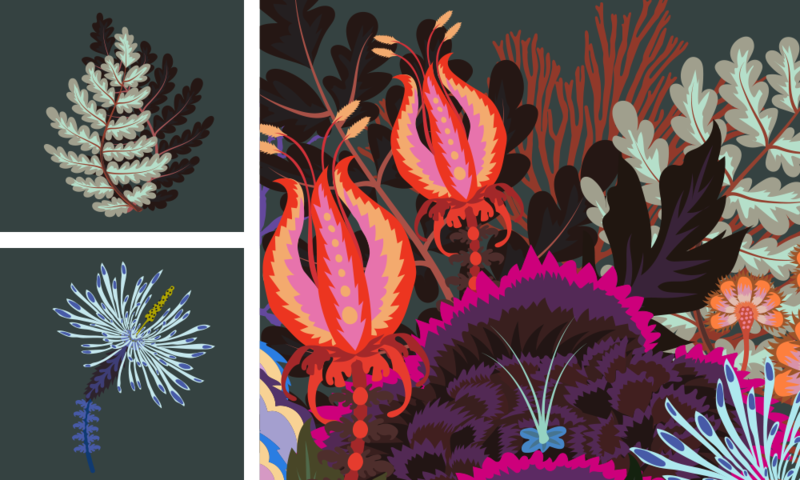 A botanical study of bold, wild florals found thriving within the secret centre of Jupiter. I wanted to create something that was completely fantastical, playful yet seductive. A print that, when applied to fabrics, would provide a way of immersing into another world of bright, strange and magnificent plants - an escape from reality to a faraway place. This digital Illustration was created in Adobe Illustrator by drawing into the programme with a Wacom pen and tablet. I was inspired by Japanese woodcuts and 17th Century French Textiles and the desire to design something that seemed as if it came from a distant land. A new take on Asian and ornamental influences - a nod to the original collections of Arthur Lazenby Liberty. As a heritage-loving British print designer, recognition by Liberty is the greatest accolade I could wish for. Watching the design work within new spaces and being used for many different and exciting projects will make my heart sing. This year’s #LibertyOpenCall prize also puts the winners at the centre of the creative process, as they will now spend time developing the artwork alongside the Liberty London Design Team, before watching their fabrics being printed at Liberty London’s fabric mill in Italy early next year. Stay tuned for updates on their journey.